This family’s vacation home, in the Suncadia Resort of Washington state, had some special requirements — the daughter has special needs, and the mother of one of the homeowners is in a wheelchair. Universal design with the appropriate access and clearances was paramount. Architect David Clinkston and interior designer Barbara Hyde Evans teamed up, creating a wide-open space that incorporates the kitchen, family room, game area, dining room and storage for their daughter’s medical equipment with seamless modern-lodge style. At the same time, there is clear and well thought-out access for how the family functions, whether Dad is cooking in the kitchen with everyone around, Mom is leading the family in a board game, the whole group has gathered to watch a movie after a day outside in the snow, or they are extending the dining table for meals with extended family. One of the homeowners loves to cook, and he wanted to have the whole family around while he prepared meals. 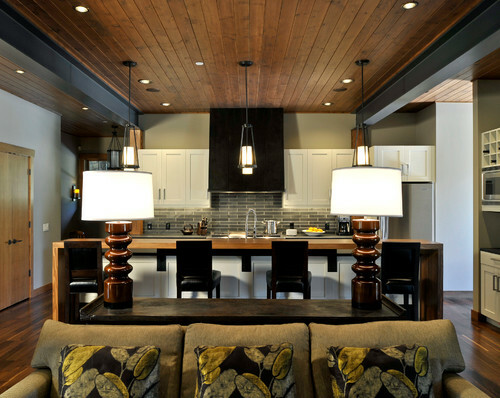 The kitchen and family room needed to work together in a seamless way. To the designers this meant avoiding a kitchen that looked too kitchen-y from the other room. The alignment of the sofa, sofa table and kitchen island is no accident. “From this view it almost looks like the fir bar is part of the console behind the sofa,” Hyde Evans says. The fir ceilings, steel beams, flooring and colors create flow and continuity between the spaces. “These pillows were a splurge, but they are so beautiful and they really tie all of the colors of the rooms together,” Hyde Evans says. To achieve the modern-lodge look, they had the tongue and groove fir ceiling stained with an Old Masters stain in Special Walnut. The design duo picked up on the look of the blackened steel beams via the light fixtures, the structures that attach the fir bar to the island, the custom vent hood and other furniture choices, like the coffee table’s iron base. “David is really easygoing and never has an ego that gets in the way,” Hyde Evans says. While Clinkston completed the architectural plans, the team collaborated on everything, down to the small details. “Barbara came up with the idea to use fir on the raised bar,” he says. “We kept tweaking the design together.” The raised counter stands up to the scale of the other large elements in the kitchen; the wood is 2⅜ inches thick. It was sealed with a waterborne clear finish called SDA urethane that stands up to kitchen wear and tear. Tip: If you cannot find tile in the size you want, have it cut onsite. 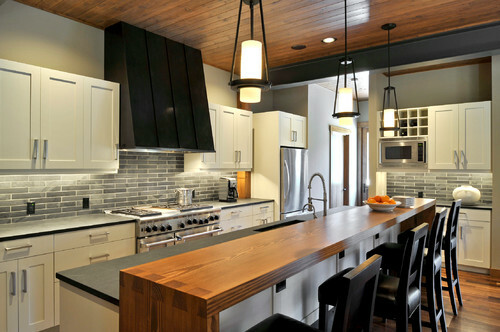 Here they cut 12-inch by 12-inch midtone to black slate tiles into 2-inch by 12-inch tiles to create the backsplash. The color variation adds interest in the kitchen and plays off the blackened steel. Large-scale cabinet hardware stands up to the soaring ceiling. A large custom coffee table grounds the family “room.” Its blackened steel base plays off the beams. 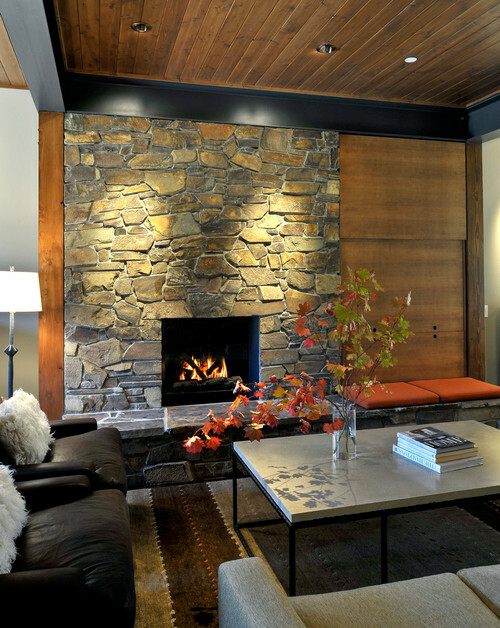 The concrete top works well with the Montana ledgestone fireplace. The space to the right of the sofa was left empty to leave room for a wheelchair. Also, there are 5- to 6-foot clearances all over the space to provide enough room for the turning radius of the chair. 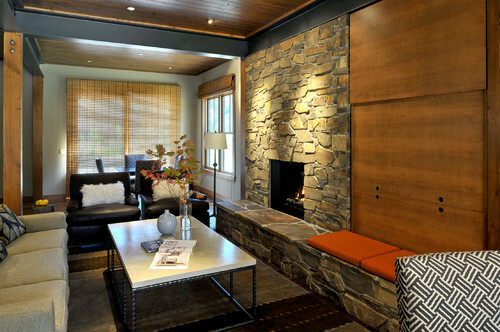 The couple worked with cabinetmaker Michael Bello, of Cedar Mountain Woodwrights, to create the fir cabinetry system on the right of the fireplace. It utilizes counterbalance weights like those found on old double-hung windows. The light touch of fingers in the holes lifts the middle part up to reveal a TV, and the bottom section drops down to reveal media components. 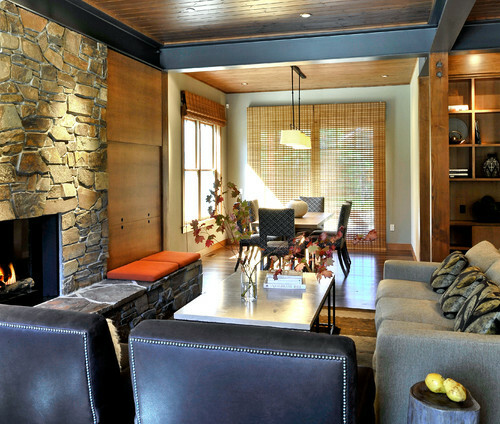 Custom cushions on the hearth provide extra seating — the homeowners love to host extended family gatherings here. Beyond the living room is the dining area; the dining table extends to accommodate extra guests. The open plan helps with clearances and maneuverability. To the right, beautiful built-ins stretch down toward the kitchen, adding more warm wood and storage for books and favorite objects, like the golf trophies of one of the homeowners’ mothers. The end of the room opposite the dining room has a table for playing games. Hyde Evans used the same chairs so that they can be used at the dining table when needed. To the left of the game table is a special closet for storing the medial equipment their daughter requires. Beyond the natural reed blinds are French doors that lead out to a patio, expanding the living space into the spectacular mountain surroundings. Want to learn more? Let us know how we can help!